A LEAKED report has revealed that two of Clydesdale’s abandoned opencast coal mines will soon become not just eyesores but hazards. The document warns of the serious consequences if there is no action over the long-term maintenance of the Mainshill and Glentaggart sites. 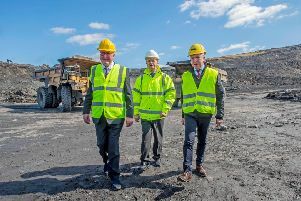 The confidential report, from liquidators for the former operators Scottish Coal, KPMG, to creditors states that parts of the Mainshill site are due to flood and overflow into the surrounding countryide while at Glentaggart there is a more vague warning of a “growing risk of an incident” should its long-term future be left undecided.